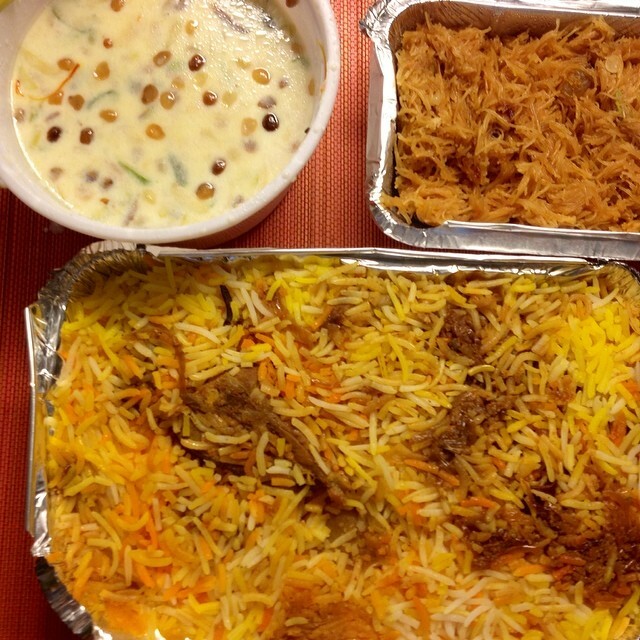 Why Biryani on Eid will never taste the same again. "You must be wondering why I didn't bring you biryani on Eid this time," he said. Softly as always. "No, not at all. Please don't bother. I think I was busy too," I replied to Q who had just finished fixing a problem in our air-conditioner. "Last two Eids actually," Q continued softly with a smile as he packed the tools of his trade into his bag. Then he suddenly stopped and looked up. I looked back at him. Was something the matter I wondered. I had come out to the drawing room to make the payment and wanted to get back to my desk and my work. "My wife, who used to make the biryani was unwell you see," he continued. We were speaking in Hindi of course. "She passed away a few months back," he said and looked at me with a wan smile. More a helpless shrug than a smile you could say. I was stunned. I did not see this coming. K, who was sitting on the sofa and working on her phone, looked up too. Startled. "What happened," we both asked at the same time. "She had cancer. She fought it for about a year. The pain got too much in the last six months. Then she passed away quietly one morning, after suffering a lot all night." We looked at him, our faces frozen in shock. "I had sent her to her mother's house in Solapur so that she could be taken care of while unwell as I was out at work everyday. However, I would take the bus from Mumbai every weekend for a year to be with her there. I would take our children too. This time I could not reach in time but I had realised that this would happen when I got the call. She was in a lot of pain that night. I knew." "We are very sorry to hear about this," said K.
"I am so sorry to hear about her," I repeated. Then, with a wry smile added, "and I remember the biryani you used to get us so well. It was so good. To be honest, I looked forward to it every time and would be so happy when you would come with it. I am so sorry. Truly." His eyes lit up suddenly as if a rush of memories had come back to him. Happy ones. "Yes, she did make a lovely biryani. She would work really hard and make it entirely by herself every Eid and I would distribute it among our friends and family. Everyone loved it." "She was very good at embroidery and tailoring too," Q added and then proudly said, "she was very young when she came from the village after we got married. She did not know anything. Everything in Mumbai was new to her. I encouraged her to learn different skills so that she could feel independent. She was very talented. Her embroidery work was well sought after." We quietly listened to him. It struck me that we had known him ever since we had moved into a house which had ACs which had been kindly left behind by the gentleman who had sold it to us. Q had come to service them after we had found him through a local shop back then and has continued to do so over the years. It has been about fifteen years since then. We have switched three houses. Bought a few ACs during the process. Our own this time, including a couple from him. Q had been a part of our lives all through, servicing our ACs and dropping in to help us shift them when needed. We knew him as someone who is sincere, soft spoken, very courteous and always smiling. Someone who is very good at his work and whom we trust and happily recommend to people. But we did not know anything beyond that. About him. Or his family. This, even though I had tasted and relished the biryani and sev and sheer qorma that he would get every Eid. A dinner I would look forward to. "Would you like to see her picture sir," he suddenly asked. I expected him to take out a passport photo from his wallet but instead he came to us his with mobile and then opened his Facebook page. There she was. Smiling radiantly back at us. In festive finery. Looking so happy, warm and at peace. "This was just after her 40th birthday a couple of years back." "Did you know about her cancer then," I asked. "No, we got a to know about it a couple of months later." "What about your kids," asked K.
"Oh, they are not that little now. I have a son and a daughter. Both in their mid twenties. She has finished her studies and we hope to get her married. He is trying to pass his CA." "You live in Bandra right?" I asked. "I moved out with them after their mother passed away. We were in a mohalla and there was a lot of distraction. I have taken a small apartment at Andheri. My son can study in peace there. My daughter likes it too." Q then turned to leave. "Apna khayal rakhna," I muttered. Look after yourself. K repeated my words to him. "Apna khayal rakhna"
I patted him on his shoulder as he left. I didn't know what else I should have done. Give him a hug? Hold his hand firmly? Perhaps I should have offered him some water at least. One never knows what to do at such times. However, the day the incident happened I told myself that I will write about it one day. That I would do so to share the story of a wonderful lady whom the world lost too early and that of a most forward thinking man, who loved her a lot. It has taken me more than a month to do so I am afraid. I guess I got caught up with my life, but today was the day to fulfil the promise I had made to myself. That's the least one could do. I owed it the biryani and its maker.